The ongoing controversy about the coconut tree not being a tree but a palm brings to mind Damodar Mauzo’s short story These are My Children, where the main protagonist, Rosalina, names her coconut trees after her three children who have left home to start a life of their own. The trees are surrogates for her children and she treasures them to the point of crossing swords with the authorities. Her last words in the short story are, ‘No! I won’t let you cut my trees. Cut me first, then cut my children!’ The underlying theme is that the importance of the coconut tree is equivalent to that of one’s own children. The scientific fraternity has categorised the palm (Arecaceae family) in terms of trees, shrubs, and woody vines. Palm trees, in fact, are noted in the regions where they thrive for their productive role in human life. The coconut palm has been labelled as a tree because of its growth habitat. The United States Department of Agriculture definition of a tree says: ‘Perennial, woody plant with a single stem (trunk), normally greater than 4 to 5 meters (13 to 16 feet) in height; under certain environmental conditions, some tree species may develop a multi-stemmed or short growth form (less than 4 meters or 13 feet in height)’. Yet the establishment in Goa has suddenly deemed it fit to remove the coconut palm tree from the category of a tree. In the wake of the building frenzy in this tiny State, often under the patronage of higher-ups, it would be pertinent to say there is something rotten in the state of Goa. Indeed, the coconut tree has long served a multitude of purposes. It is for this reason that the tree is referred to as Kalpvriksha or wish fulfilling tree. So revered is this fascinating gift of nature that Kerala, the Indian state that abounds in coconut trees, is named after the tree as ‘Kera’ means coconut tree. Kerala, therefore, means ‘Land of the coconut tree’. In Goa, the coconut is the staple of any diet. Hindus and Catholics alike have recipes innumerable to please the dietary yearnings of any gourmet. Palm fronds are woven to create shelters, roofs, sieves, baskets, etc. The drupe gives us nutritious water, and milk squeezed out of grated coconut kernel contributes to appetising curries, particularly the famous Goan fish/prawn curry accompaniment to rice. Coconut oil has been used not just as a culinary ingredient but as beauty enhancing agent – a hair conditioner and a skin moisturiser. The oil is supposed to increase HDL cholesterol as opposed to LDL, which is said to be an indicator of low risk of heart problems. It is the toddy obtained from the coconut bud that gives us our madanchem goddh (jaggery), obtained after cooking the toddy over a slow fire and adding grated coconut to it. And what would we do without the famous coconut feni or launecho soro and vinegar made from coconut toddy? There is a plethora of uses attributed to the coconut palm. However, in this day and age of environmental degradation and global warming, the most important function it plays is that of a carbon sink and as a barrier to the high speed winds of cyclones and the monsoons. The network of tree roots absorbs the excess water of floods (remember Chennai 2015), and holds the soil together, thus preventing soil erosion. 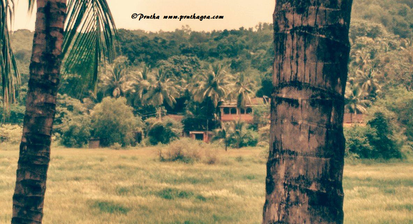 Since the coconut palm tree is endemic to Goa, it is the most practical to plant and maintain in order to regenerate our devastated environment. The people of Goa are clearly outraged and certain activists are up in arms with the Government, using social media and imitating the Chipko Movement. The struggle may be difficult, but we must not waver in our enthusiasm to save the coconut tree and battle the root rot of corruption that has beset it. 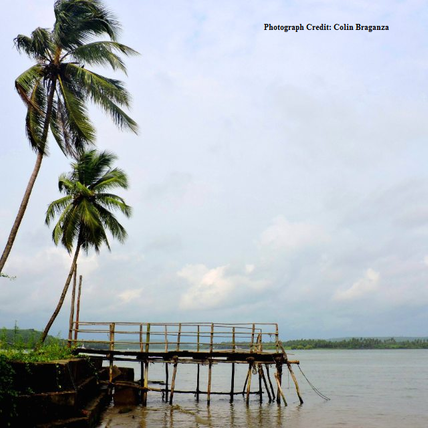 Save Goa's Beloved Coconut Tree!